Beatle Girls: I have an endless fascination with the Beatles' wives and girlfriends. It seems silly how many girls hate them out of sheer rediculous jealousy. Those four lads had fantastic taste in women, so many of them were so deeply inspirational... in their careers, their passions, their talents and even just their day to day behaviour, how they got on in the world. Maureen is my favourite by far, I think she's absoloute perfection. Wish she were still around. Vintage Fashion: I love that Coco Chanel quote "I'm against fashion that doesn't last. I cannot accept that you throw your clothes away just because it is Spring" I also can't understand why everyone insists that their clothes are a reflection of who they are... and then they go out and buy exactly what everyone else around them is wearing... what does that say about you? That you're a sheep with no mind of your own? That you're completley ruled by peer pressure? I can't stand all that. I wear what I want... which is mainly slightly far out and often from the 1960s. I love all the brightly coloured geometric fashions and am most comfortable in a polo neck, mini skirt and kitten heels. The beautiful Dollyrockers range created by Samuel Sherman, the geometric clothing by Quant's Ginger Group. But I also like the 1970s and even 1990s clothes on Barbara Hulanicki's Biba label which make up a large part of my daytime wardrobe... Dollyrockers being the main label in me evening wardrobe. I like Pucci for nightwear cos it's far-out but pretty. One nightie looks like it's fallen out of the Yellow Submaine film, and the next is all soft chocolate and lace. And whoever invented fishnet stockings, knee high boots, velvet jackets and stiletto heels should all be given knighthoods because I couldn't be me without any of those. Music and Musicians: My musician habit is probably my greatest vice, but how could you not love musicians when they create something as magical and earthshatteringly powerful as music. I don't even care what era or type of music it is, so long as it's created by real inspirational talented people I can usually appreciate it. Classic Rock by The Who and Led Zep is amazing, and Poison by Alice Cooper was disturbingly one of my favourite songs as a child. But then there's the soft warm comfort of a Dean Martin song, the thrill of Gene Krupa setting the room on fire with a drum beat, Billie Holiday making the cold world just that little bit more shivery yet bearable, the Beatles making everything nice and shiny and cuddly again, the Lightning Seeds making sunbeams and rainbows bounce around in your soul, and each and every fabulous amazing creative person out there that catches another little magic part of my soul and makes it sing. I'm particularly fascinated with drumming and think drummers are the best invention on the whole planet (so I'm totally into that Hindu idea that the universe was created with a drum beat rather than a big bang - yay Shiva! ), but bassists are particularly dark and thrilling too, the guitarists putting all the magic stuff in there that you can't quite pin down... and lead singers are sometimes alright I guess when their egos don't get in the way of their existance and their body doesn't get imbetween me and a good view of the drummer! 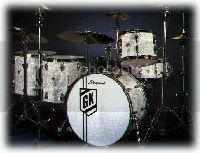 Wow Gene Krupa's drum set. How cool. You said "I'm particularly fascinated with drumming and think drummers are the best invention on the whole planet." I'll take that as a compliment. Thank you! Peace.